Eurgh, not well at all, still have this damn cold – or is it some kind of flu? (I ache all over, and feel somewhat constantly hallucinated) was bed-ridden most of Wednesday, seem to feel better after being up a few hours, then it gets worse again. Got myself together to some degree on Wednesday afternoon, continued with XTM logo/brand ideas, some more exploration of concepts, but didn't manage to achieve too much. Leon and I had a discussion on the potential font directions. I think Leon is still pretty badly under the weather with his cold but hanging in there like a trouper! 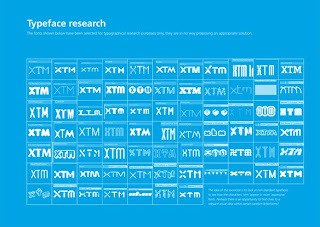 Whilst many of the fonts will simple not work for XTM (interestingly enough, we have already shortened the brand name down to XTM in our minds from XTM International - something that could not be done with the previous name of XML Intl - am very glad we managed to persuade the client of the merits of a complete company name change). Anyhow, whilst many of the fonts don't work, it did bring up some interesting ideas about 'flow' and 'connections'. XTM is effectively 'language translation management technology' ... so there are elements of engines, work flow, input / output & trust that we need to communicate visually. Am currently not sure how Leon plans to visualise this AND connect it to the letters XTM ... maybe a separate ideogram will be required. So by this Friday, we need to supply our client with concepts for brand/logo/stationery... 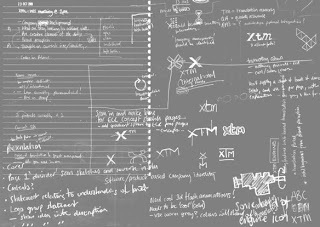 I'm continuing to explore the essence of what XTM is about, and how to visualise it for the brand. I'm planning to submit around 4-5 solid and reasoned directions (normally, this might be 2-3, however, I think this brief is rich with many potential outcomes, and want to explore as much as possible). Travelled to beautiful Gerrards Cross, for my initial meeting with our client. I myself met Bob and Elliot for the first time - really nice guys! 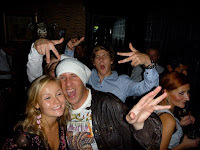 Jan-Erik, who also attended today, had met them before. 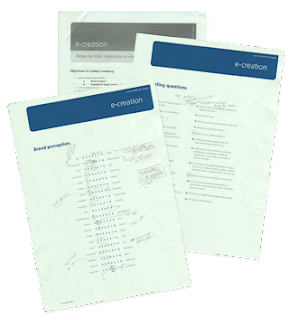 We went through Jan's meeting agenda, covered various items such as scope of work, requirements from client, schedule, agreed content ideas, went through briefing questions and discussed our brand perception map. We also went through the current brand and website design, to identify reason, and any points of value to consider. It very much looks like we have a clean slate to work with – yey! Seemed like a long day as travel alone was over 5 hours in total, but well worth it for me to meet our clients face to face.